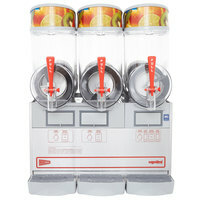 A commercial slushie machine is a versatile addition to any snack shack, concession stand, convenience store, gas station, or bar. 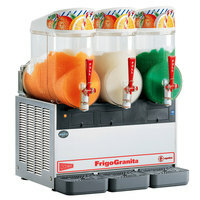 These granita machines are perfect for making a variety of products, from slushies to smoothies, and y ou can even use them to make frozen cocktails. Our selection of machines includes high performance models for faster freeze times and standard units for light-duty use. You’ll even find machines that automatically mix liquid concentrates or flavored powder with water so your employees don’t have to waste time doing it themselves. 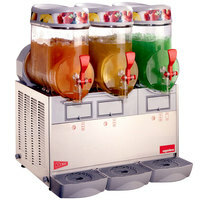 Not only does a slushie machine effectively merchandise your frozen drinks, but it also uses augers to continuously mix contents to maintain your beverage’s texture and consistency. Once you’re ready to serve a customer, simply pull on the unit’s handle to open the non-drip faucet for easy dispensing. Whether you’re looking for a single compartment granita machine for use in your low-volume establishment, or you need a multi-bowl unit for your high-volume needs, we have you covered. 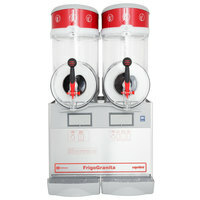 Good- Capable of producing both frozen and liquid beverages, this Cecilware FrigoGranita NHT2UL double 2.5 gallon bowl pourover granita dispenser is great for accommodating high volume consumer traffic areas. While its single-sided lighted graphics provide attractive merchandising, its suction cup compression seal system safeguards gear motors from product spillage. This unit also features an adjustable slush mode for ensuring beverage consistency and a 24 hour programmable timer for decreasing downtime. Its freeze-up monitoring system also prevents motor burn-out, while its stainless steel auger shaft helps you avoid time-consuming maintenance. 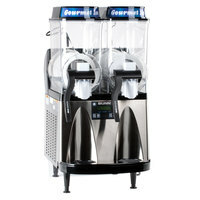 Better- Constructed with a durable stainless steel body and evaporator, this Narvon SM262 double 2.6 gallon pourover granita/slushy/frozen beverage dispenser is sure to withstand the test of time as it substantially expands your beverage menu in addition to your sales revenue. Boasting a bright LED light inside the bowl itself, this unit adds great visibility to your specialty offerings of smoothies, slushies, and refrigerated drinks. 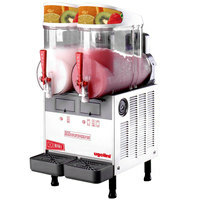 So whether you wish to whip up a frozen treat or a chilled beverage for your valued customer, this unit’s intuitive temperature control and bowl slush thickness control will enable you to produce the perfect consistency each and every time! Its removable drip tray and convenient thumbscrews also make cleanup and disassembly a low-hassle experience. Best- This Vollrath VCBF128-37 dual 2.6 gallon frozen beverage machine is bound to boost sales revenue through the massive expansion of your drink menu. 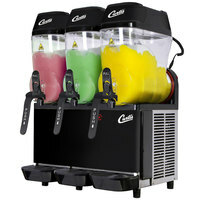 Complete with clear casings and interior lights for appealing beverage identification and display, this unit’s 10 liter bowls will entice onlookers to indulge in their offerings of smoothies, slushies, granitas, iced coffee, and lucrative frozen cocktails. 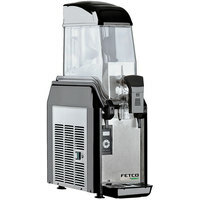 While its easy-to-use controls, such as a frozen beverage mode and a granita setting, allow you to serve these specialty drinks at the ideal temperature/consistency, its magnetically-driven motor, boasting zero gears and less parts, ensures your machine requires fewer service calls. Plus, its large freezing surface and properly-sized compressor promote efficient operation through reduced downtime, saving you time and money. Its gasketless spigot also makes cleanup a snap! 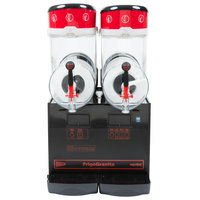 Good- Built with well-lit graphics and a reversible lid for supreme merchandising power, this Cecilware FrigoGranita MT1PUL single 2.5 gallon pourover slush machine is bound to attract attention and boost impulse sales at your establishment. 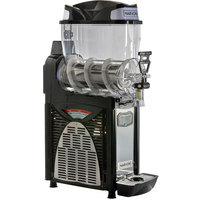 This unit not only boasts a dual surface freezing chamber for better beverage consistency, but it also features dual augers for keeping your specialty product level. Its filter indicator light will also alert you to when cleaning is required, allowing you to maintain an impeccably efficient machine! Better- Constructed with a stainless steel body and evaporator, this Narvon SM261 single 2.6 gallon pourover granita/slushy/frozen beverage dispenser is sure to withstand the test of time as it substantially expands your beverage menu in addition to your sales revenue. Boasting a bright LED light inside the bowl itself, this unit adds great visibility to your specialty offerings of smoothies, slushies, and refrigerated drinks. So whether you wish to whip up a frozen treat or a chilled beverage for your valued customer, this unit’s intuitive temperature control and bowl slush thickness control will enable you to produce the perfect consistency each and every time! Its removable drip tray and convenient thumbscrews also make cleanup and disassembly a low-hassle experience. Best- At 7 3/4” wide and 19 1/2” deep, this Vollrath VCBF118-37 single 2.6 gallon frozen beverage machine is bound to make a big impression despite its compact size. 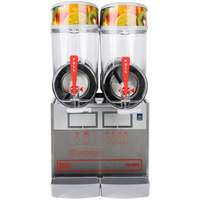 Designed with a clear casing and an interior light for appealing beverage identification and display, this unit’s 10 liter bowl will entice your customers to indulge in your expansive menu of smoothies, slushies, granitas, iced coffee, and lucrative frozen cocktails. 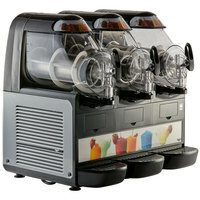 While its easy-to-use controls, such as a frozen beverage mode and a granita setting, allow you to produce these customizable drinks at the ideal temperature/consistency, its magnetically-driven motor, boasting zero gears and less parts, ensures your machine requires fewer service calls. Plus, its large freezing surface and properly-sized compressor promote efficient operation through reduced downtime, saving you time and money. Its gasketless spigot also makes cleanup a snap! 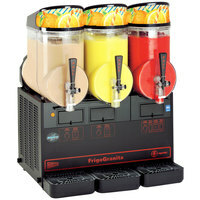 Good- Capable of producing both frozen and liquid beverages, this Cecilware FrigoGranita NHT3UL triple 2.5 gallon bowl pourover granita dispenser is great for accommodating high volume consumer traffic areas. While its single-sided lighted graphics provide attractive merchandising, its suction cup compression seal system safeguards gear motors from product spillage. This unit also features a cool beverage mode for added versatility and a 24 hour programmable timer for decreasing downtime. Its stainless steel auger shaft also protects against rust and helps you avoid time-consuming maintenance while its study rubber legs elevate the dispenser off of the countertop for easy cleaning. 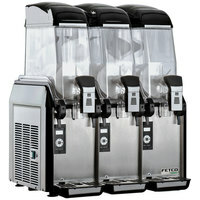 Better- Constructed with a durable stainless steel body and evaporator, this Narvon SM263 triple 2.6 gallon pourover granita/slushy/frozen beverage dispenser is sure to withstand the test of time as it substantially expands your beverage menu in addition to your sales revenue. Boasting a bright LED light inside the bowl itself, this unit adds great visibility to your specialty offerings of smoothies, slushies, and refrigerated drinks. So whether you wish to whip up a frozen treat or a chilled beverage for your valued customer, this unit’s intuitive temperature control and bowl slush thickness control will enable you to produce the perfect consistency each and every time! Its removable drip tray and convenient thumbscrews also make cleanup and disassembly a low-hassle experience. 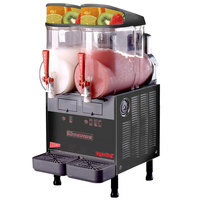 Best- This Vollrath VCBF168-37 triple 2.6 gallon frozen beverage machine is bound to boost sales revenue through the massive expansion of your drink menu. 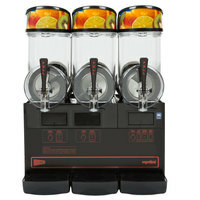 Complete with clear casings and interior lights for appealing beverage identification and display, this unit’s 10 liter bowls will entice onlookers to indulge in their offerings of smoothies, slushies, granitas, iced coffee, and lucrative frozen cocktails. 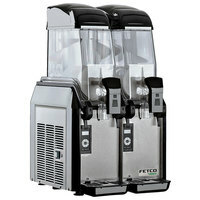 While its easy-to-use controls, such as a frozen beverage mode and a granita setting, allow you to serve these specialty drinks at the ideal temperature/consistency, its magnetically-driven motor, boasting zero gears and less parts, ensures your machine requires fewer service calls. Plus, its large freezing surface and properly-sized compressor promote efficient operation through reduced downtime, saving you time and money. Its gasketless spigot also makes cleanup a snap! 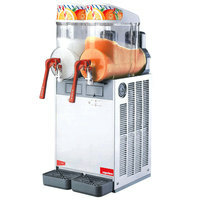 Good- Only 7 1/16" wide and 18 1/2" deep, this Cecilware FrigoGranita MT1MINI single 1.5 gallon slush machine is perfectly proportioned for areas with limited countertop space. Its 24 hour programmable defrost timer decreases downtime and maximizes sales, while its adjustable slush mode enables you to produce the ideal drink consistency for each individual customer. A cool beverage mode also ensures that you can provide a variety to thirst-quenching options at your establishment, such as fruit punch and pink lemonade. Best- At 7 3/4” wide and 19 1/2” deep, this Vollrath VCBA118-37 single 1.6 gallon frozen beverage machine is bound to make a big impression despite its compact size. 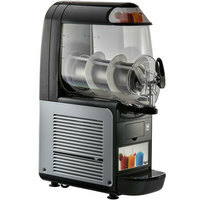 Designed with a clear casing and an interior light for appealing beverage identification and display, this unit’s 6 liter bowl will entice your customers to indulge in your specialty offerings of granitas, smoothies, ice coffee, and lucrative frozen cocktails. 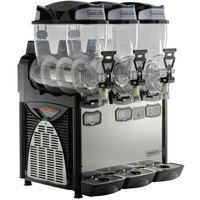 While its easy-to-use controls, such as a frozen beverage mode and a granita setting, allow you to serve these customizable drinks at the ideal temperature/consistency, its magnetically-driven motor, boasting zero gears and less parts, ensures your machine requires fewer service calls. 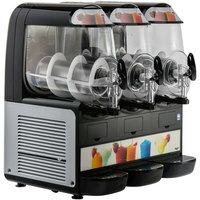 Plus, its large freezing surface and properly-sized compressor promote efficient operation, saving you time and money. Its gasketless spigot also makes cleanup a snap! Good- Only 21 1/4" wide and 18 1/2" deep, this this Cecilware FrigoGranita MT3MINI triple 1.5 gallon pourover slush machine is perfectly proportioned for areas with limited countertop space. Its 24 hour programmable defrost timer decreases downtime and maximizes sales, while its adjustable slush mode enables you to produce the ideal drink consistency for each individual customer. A cool beverage mode also ensures that you can provide a variety to thirst-quenching options at your establishment, like fruit punch and pink lemonade. 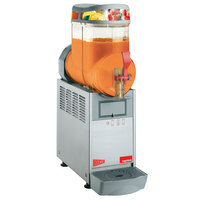 Best- This Vollrath VCBA168-37 triple 1.6 gallon frozen beverage machine is bound to boost sales revenue through the massive expansion of your drink menu. 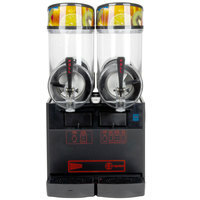 Complete with clear casings and interior lights for appealing beverage identification and display, this unit’s 6 liter bowls will entice onlookers to indulge in their offerings of smoothies, slushies, granitas, iced coffee, and lucrative frozen cocktails. 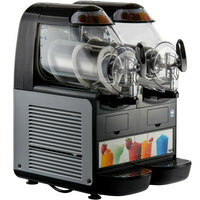 While its easy-to-use controls, such as a frozen beverage mode and a granita setting, allow you to serve these specialty drinks at the ideal temperature/consistency, its magnetically-driven motor, boasting zero gears and less parts, ensures your machine requires fewer service calls. Plus, its large freezing surface and properly-sized compressor promote efficient operation through reduced downtime, saving you time and money. Its gasketless spigot also makes cleanup a snap! 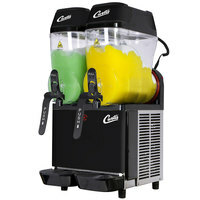 Good- Perfect for self-service applications or behind-the-bar use, this Cecilware FrigoGranita MT2MINI double 1.5 gallon pourover slush machine enables you to offer both chilled and frozen beverages in high volume consumer traffic areas. Featuring a single-sided lighted graphic and a clear casing on each bowl for superior merchandising power, this unit is certain to attract the right amount of attention. It also boasts easy-to-use controls, like an adjustable slush mode to determine the thickness of your product and a 24 hour programmable defrost timer to minimize downtime. Plus, its stainless steel auger shafts protect against rust, while its sturdy rubber legs elevate the dispenser off of the countertop to ensure easy cleaning. Best- This Vollrath VCBA128-37 dual 1.6 gallon frozen beverage machine is bound to boost sales revenue through the massive expansion of your drink menu. 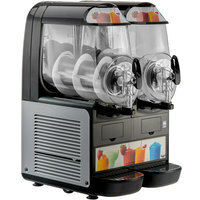 Complete with clear casings and interior lights for appealing beverage identification and display, this unit’s 6 liter bowls will entice onlookers to indulge in their offerings of smoothies, slushies, granitas, iced coffee, and lucrative frozen cocktails. 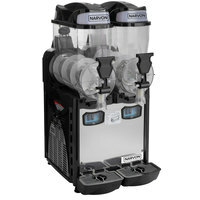 While its easy-to-use controls, such as a frozen beverage mode and a granita setting, allow you to serve these specialty drinks at the ideal temperature/consistency, its magnetically-driven motor, boasting zero gears and less parts, ensures your machine requires fewer service calls. Plus, its large freezing surface and properly-sized compressor promote efficient operation through reduced downtime, saving you time and money. Its gasketless spigot also makes cleanup a snap!